It was 1987, and Kings Entertainment Company, owner of Kings Island at the time, wanted to kick off the park's fifteenth anniversary with a bang. The park turned to the Utah based Arrow Dynamics to build them a looping coaster. The park already had experience with looping coasters in previous years, including the defunct Screaming Demon, the first Arrow launched loop shuttle coaster, and Togo's King Cobra, both featuring vertical loops. 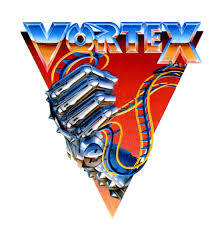 However, this new steel giant was to be built to break records, and in the winter of 1986, construction began on Vortex. At this point in time, the record for most inversions was held by Viper located atDarien Lake, which contained five head-over-heels elements. Kings Island set out to claim that record and include six inversions including two vertical loops, a double corkscrew, and the all too rare batwing element. Along with the inversion record, Vortex was to be the tallest coaster, soaring up to 148 ft above the ground and dropping 138 ft of that height, reaching speeds of 55 mph along it’s more than 3,800 ft of blue and orange track. Getting to the steel knot is an easy task, as it is one of the first things you see along with the signature Eiffel Tower upon approaching the park. It is located in the back within the Coney Mall section of the park, practically next door to the infamous Beast. Guests get to experience it before they even ride it, for the final batwing inversions soar above the midway, just a few feet from guests. After entering the queue aside the final brakes, long time guests may notice that the new looping coaster inhabits the former Bat'sold station (some of the footers are still visible around the station). After choosing from one of 28 seats in the sleek blue and orange trains, the restraints are checked and the ride begins. Out of the station, the ride drops slightly and takes a hard right to begin ascending the lift hill. At this point, the slow rise to the top allows guests to take in the view before plunging into oblivion. To the left, the few telltale signs of the Beast's existence appear in the two lift hills. String lights and a catwalk also appear to the port side of the train. To the right, the rest of the park and the coiled entanglement of steel that the Vortex possesses lie in wait. After cresting at 148 ft, the train dips slightly and coils to the right sharply. After leveling off the banking, the train nosedives at 55 degrees, plunging 138 ft. and bottoms out at 55 mph. The train rises about 100 ft or so, leaning to the left in a swooping maneuver high aboveRivertown. After swooping up, the train curves to the left and levels out as riders prepare to face the first two inversions, a double vertical loop melee. After exiting the second loop’s peak, the train rises above the station from whence it came and makes a 180 degree direction change, moving parallel to the lift as rider’s take a slight breather on the mid course brake run. The action picks up again as the train dives and curls through a double corkscrew feature, common among Arrow looping coasters. The train exits the 4th inversion and makes a beeline for the midway, having to turn right in the process. Just before the train seems to careen into the midway passerby's, the train inverts to the left and completes the first part of the batwing maneuver. After the on-ride photo spot at the valley of the element, the train rises to invert for the 6th and final time, thus completing the batwing. The journey ends as the train hauls riders to the left with in the positive g-filled 450 degree upwards helix and slides into the final breaks. Although bigger and better looping coasters have been erected since Vortex's debut, it still remains a must-do ride in the park and a favorite among the Kings Island locals.